Denver, Colorado, is a walkable, outdoor city with 300 days of sunshine, brilliant blue skies and breathtaking mountain scenery. Founded in 1858 as a gold mining camp, Denver is located at the base of the majestic Rocky Mountains, 5,280 feet (1,609 meters) above sea level – exactly one mile high. Denver offers urban adventures for all ages, spring, summer, fall or winter. Explore The Mile High City without ever needing a car. Getting into the city center is easy with direct rail service from Denver International Airport to Denver Union Station, just steps from the 16th Street Mall free shuttle that runs through the heart of the city center. And don’t forget to take a photo with the Blue Bear, Denver’s public art icon at the Colorado Convention Center. Here are 10 great reasons to visit Denver. Red Rocks Park & Amphitheatre is famous for its one-of-a-kind outdoor concert venue that is surrounded by giant, ancient rock formations. During the day, Red Rocks is a free city park with easy hiking trails and a visitor center that includes a Performers&apos; Hall of Fame. Legendary musicians like the Beatles (1964) and U2 (1983) have performed here, and today, the summer concert series from May through October presents the best artists in jazz, rock, pop, bluegrass and more. Seeing a concert under the stars is a magical experience. Red Rocks Park is located 30 minutes west of downtown Denver. Downtown Denver&apos;s Union Station has undergone a massive restoration and redevelopment that has transformed the landmark into a transportation, dining, shopping and entertainment hub, all centered around the new Crawford Hotel. The station is a now a fun gathering place for locals and visitors – eat a breakfast burrito at Snooze, sip a beer at the Terminal Bar, sample the locally sourced cuisine at one of the unique restaurants, shop a bit or have a hand-mixed cocktail at Cooper Lounge. Direct rail service connects Denver International Airport (DEN) to this landmark in the heart of downtown in 37 minutes. Take a self-guided tour along the Denver Beer Trail and sample the craft beer paradise in The Mile High City. Explore the featured breweries, most in the walkable downtown area, and you will find everything from stouts to lagers and all the flavors in between. Denver&apos;s craft beer culture is thriving and creative. Rockmount Ranch Wear is the historic shop in downtown Denver where a true Western icon, Jack A. Weil (1901 - 2008), invented the first cowboy shirt with snaps instead of traditional buttons and helped popularize Western wear as legitimate American fashion. Many of the Rockmount designs are worn by movie stars and music legends, all with the signature design of diamond snaps and sawtooth pockets. The grandson of “Papa" Jack Weil, Steve Weil, continues the traditions today, and the store is located in the heart of downtown. Historic Larimer Square is Denver&apos;s oldest and most historic block, home to the first saloons and businesses in The Mile High City. Today, the Victorian buildings have been transformed into shops, wine bars and the hottest, chef-owned restaurants. Look for the sparkling lights strung across the street, relax at an outdoor cafe or bar, taste the best of cuisine created by local chefs or find unique clothing and accessories in the boutiques. Denver Art Museum is home to a famous collection of American Indian art. Explore the bold contemporary art inside and out of the Frederic C. Hamilton building, designed by world-famous architect Daniel Libeskind. The museum, located in downtown’s Golden Triangle Creative District, also offers free general admission on the first Saturday of every month and is free for kids under 18 at all times. The Golden Triangle is also home to galleries, fine-art studios, specialty stores and museums including Clyfford Still Museum and the Kirkland Museum of Fine & Decorative Art. Denver&apos;s History Colorado Center features exhibits and programs that tell the stories of Colorado and engage visitors in the past, present and future of the Rocky Mountain West. Enjoy interactive exhibits like a virtual ride in a real Model T, test your skills on a ski-jump simulator or set off dynamite in an 1880s hard-rock mine. B-CYCLE TO NEIGHBORHOODS - RINO, ART DISTRICT ON SANTA FE AND MORE! Vibrant arts and culture is just two wheels away! Explore The Mile High City using B-cycle, Denver&apos;s pioneering bike-sharing program and pedal your way through Denver&apos;s creative art districts that surround the city center. Discover the River North Art District (RiNo), which is rapidly becoming the hotspot for artists, foodies and designers. While retaining its industrial character, RiNo offers colorful street art murals and art galleries, plenty of cafes, brewpubs, and innovative restaurants. Visit the Highlands neighborhood, just north of downtown or the Art District on Santa Fe, which is home to more than 30 galleries, artist studios and creative businesses. Denver&apos;s art districts also celebrate the first Friday of each month with art walks. Galleries stay open late in a festive atmosphere. Cherry Creek Shopping Center is home to more than 160 stores and restaurants including Macy&apos;s, Neiman Marcus, Nordstrom, Abercrombie & Fitch, Levi&apos;s, Michael Kors and Hugo Boss. Download your "Passport to Shopping," offering discounts for more than 60 stores and restaurants. Head across 1st Avenue to find the charming, tree-lined streets of the Cherry Creek North neighborhood. Here you can explore galleries, boutiques, restaurants, coffee shops, spas and more. Cherry Creek is located just 15 minutes southeast of downtown. Purchase a Mile High Culture pass or Denver CityPASS for the best way to explore some of the city’s most fascinating attractions at a bargain price. 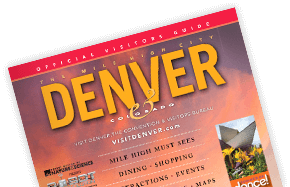 Purchase at the Tourist Information Center or online at www.denverattractionpass.com. Attractions include the Denver Art Museum, Denver Museum of Nature & Science, Clyfford Still Museum, Denver Botanic Gardens, the Denver Zoo and more. Stroll through the lush oasis of Denver Botanic Gardens; explore the life and work of the abstract expressionist Clyfford Still, considered one of the most influential painters of the 20th century; or, experience the Denver Museum of Nature & Science where you can get as close to a T-Rex dinosaur as you dare.